11 Popeshead Court is a contemporary 2 bedroom apartment in a converted warehouse located in the quaint sickle ways in the heart of York city centre. We have stayed here before,the location,accommodation and service is outstanding you will not be disappointed. Excellent location right in the heart of the old city, just a few minutes walk from anywhere. Very comfortable, well equipped flat which made the ideal base for our city break. Stayed in number 11 for 3 nights with our two young grandchildren. The location is superb for all the main York attractions and restaurants etc as it is smack bang in the centre of York. The only downside is you can only bring a car to the building between 5pm and 10 am. However this was no great problem. We met the housekeeper as arranged at the free parking location, which is about 5-10 minutes walk. She gave us the keys and parking permit then we walked to the apartment and came back later for the car to get our luggage after 5 pm. 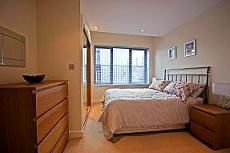 The Apartment itself is beautifully appointed and spotlessly clean and is very roomy. There is a smart television (with all the major online TV services) and free Wifi available. Our only negative was that the open plan kitchen area is a little small, particularly the limited amount of worktop space, because of the toaster and microwave oven. However, we did cook there two nights and we managed quite well in the end. There is also tea bags, sugar and salt and pepper available which is handy. We enjoyed this spacious centrally located apartment for our stay in York,with private parking nearby it gave us the a stress free break. great location - excellent for pub;ic transport links. Excellent spacious apartment and location, with free off site parking a short walk away. We would definitely love to come back stay again and would highly recommend Popeshead Court. Only 10 minutes walk from train Station. Very central for all shops, attractions etc. Clean, warm and comfortable. Although it was very central, it was quiet.